What happens during my appointment? The future of medical care is here, now. Hereditary Cancer- What is It? 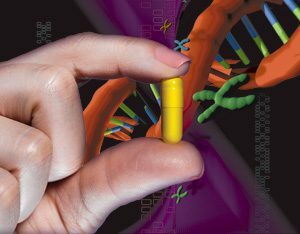 Next generation DNA sequencing has ushered in a new era of oncology: personalized cancer medicine. Working with a detailed picture of the patient’s genetic makeup, doctors can now unravel the biology of the tumor and identify the most effective treatments. If you’ve ever tried a medicine that didn’t work or caused you side effects, you know that medicines don’t work the same for everyone. Your genes influence the way your body responds to specific medicines. When you’re on a medicine that doesn’t match your genetics, you could have unwanted side effects or not be helped by the medicine. The good news it that now, The Center For Medical Genetics can analyze your genes and help your healthcare provider select the medications that are more likely to work better for you. Multiple clinical studies show that when doctors use these tests to guide their treatment, patients are twice as likely to get on the right medication. With treatment guided by the Center for Medical Genetics, patients saw a 70% greater improvement in their symptoms versus usual treatment. Many insurance plans, Medicare, and Medicaid cover these tests. Please contact our office today to learn more and to schedule your appointment.